So many times you’ve heard debt collectors and lawyers express dismay over why creditors hold onto delinquent debt without taking any action to bring in those missing dollars. That dismay comes from knowing a variety of factors. 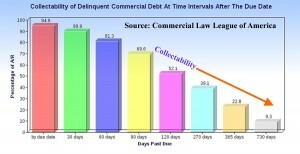 Failure to take action on a delinquent debt can cause the receivable to become time-barred by the Statute of Limitations. Here in the USA each State has its own laws to set the bar date on debts. If you’re unsure of the bar date for your customers, check with us and we’ll be happy to give you those dates. By having set and implemented a sound receivables follow up policy, you can actually reduce your internal DSO (Days Sales Outstanding) figures to provide better cash flow for your company. This will actually improve your balance sheet, especially for the sake of obtaining capital financing for yourself. However, you cannot be dissuaded from your receivables policy by the customer who professes “good intentions” without his good track record in living up to his promises of payment. We get it – really – You want to keep your customers, but what you really want is to keep your “GOOD” customers – the ones who pay you. There are dozens of clichés to describe the consequences of believing the good intent of people. However, clichés are just phrases to emphasize a point. So let’s look at the statistical analysis gained by the Commercial Law League of America in the following chart. Over time, you ability to collect falls like a stone at an exponential rate. The more you delay in taking recovery steps, the less likely you are to be paid at all. Too many times we’ve seen that the creditor who delays finds out all too well that the money has disappeared before a Judgment can be obtained. Far too often our client’s competitor has beaten our client to the bank, got their money by taking quick action, and our client is left shaking their heads wondering how did that happen. Let’s clarify something – “Taking action” doesn’t mean “starting a lawsuit.” If your customer hasn’t paid you within terms, pick up your telephone and give him a good and friendly customer service call – “Is everything ok?” You may find you have a perceived dispute on your hands – something you can quickly remedy. Regardless, always document your calls by sending a confirming email or letter – especially if you received a promise of payment. Take the high road and be courteous, always trying to be helpful. If your customer needs to set up a payment plan and you can accommodate him, do it – It may be far more expedient than filing suit. If you can settle a dispute for a discounted amount, do it for the same reason. However, if a customer refuses cooperation or communication, get the account to us, regardless of the amount. If it is uneconomical for a lawsuit, we can still try to recover the debt amicably. Sometimes it is indeed just that one additional voice which causes the payment to happen. As a simple rule of thumb, if your customer is 60 days past due, you DO INDEED have a problem. 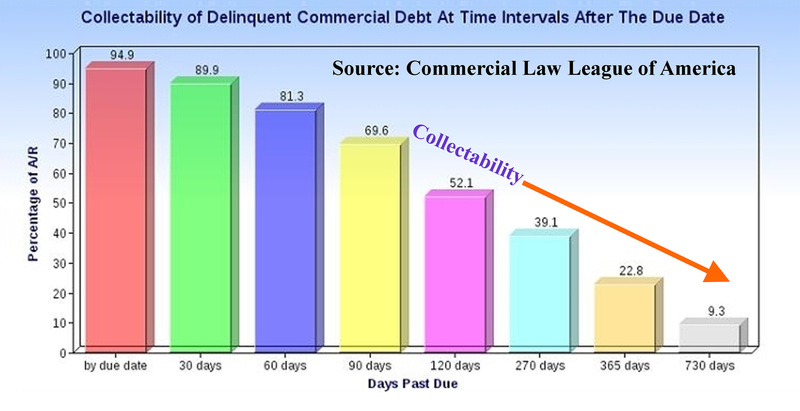 If you fail to act on it and place the debt for collection by 90 days past due, you will probably lose your chance to collect. We also recommend checking with your accountant, who may have an off-the-shelf receivables program, designed to automate your follow up process. There are several good programs in the marketplace, but using one that works well for your accountant is usually the best approach.